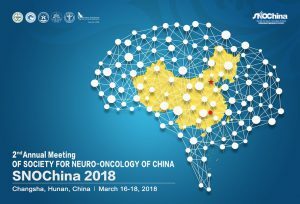 The Society for Neuro-Oncology of China has invited Dr. Sujuan Ba, the president and chief operating officer of the National Foundation for Cancer Research (NFCR), to give a lecture at its annual meeting, SNOChina 2018, to be held in Changsha, Hunan on March 16-17, 2018. The Society will present the event in association with NFCR, a co-organizer, along with the Chinese Medical Doctor Association, Beijing Neurosurgical Institute, Beijing Tiantan Hospital, Clinical Center for Glioma, Capital Medical University and Xiangya Hospital of Central South University. SNOChina 2018 will include lectures on several topics related to oncology, including cell biology, pathology, genetics, pharmacology, radiology surgery and new therapies to manage brain tumors. It is an opportunity for neuro-oncology clinicians and researchers to share their findings, connect with each other and explore future collaboration, expected to attract over 1,000 participants. The National Foundation for Cancer Research is proud to co-organize SNOChina 2018 as part of the GBM AGILE initiative. GBM AGILE is a collaboration between various organizations including NFCR, the Asian Fund for Cancer Research (AFCR) and the National Biomarker Development Alliance. GBM AGILE is a revolutionary global collaboration to test and develop new treatments for glioblastoma multiforme, the most common and aggressive form of brain cancer. Dr. Ba is also the founder and chief executive officer of AFCR.